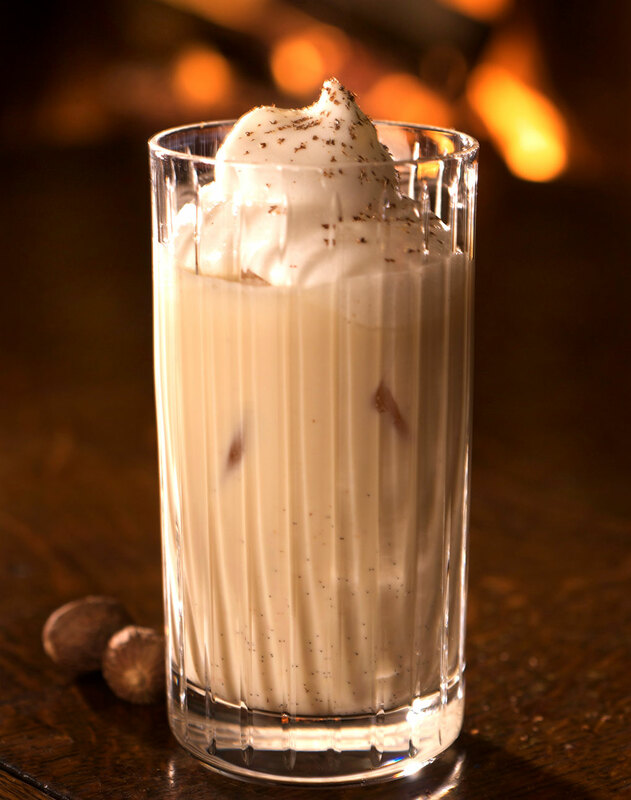 A perfect holiday eggnog is on everyone’s list. This year make one yourself. Photo by Donna Turner Ruhlman. I am traveling once again, but when I arrive back home I’ll be making my aged eggnog in preparation for the holidays. I hope you enjoy this recipe as much as I do. Not long after I began this blog in 2006, I wrote about and made aged eggnog upon reading about it at CHOW. Two years later Donna photographed it. A year after that, we finished the batch. It was a little funky and that was part of its deliciousness. I’m writing about it now so that you can, if you plan ahead, make it this weekend or next, for this holiday season, and the next, and, if you have the discipline, for December 2016. It needs at least 30 days for the aged flavor and for the alcohol to take care of any bacteria. After that it will keep for a long long time. Jonathon Sawyer liked it so much he began experimenting with different whiskeys. Last one I tried he’d use Oban, an excellent single malt that pairs well with cream. Thus the Friday cocktail is a good whiskey, on the rocks, to enjoy after you make next year’s batch of aged eggnog. Transfer the mixture to a 1-gallon glass jar and tightly seal the lid. (Alternatively, you can bottle it.) Place in the refrigerator for at least 3 weeks and up to 3 years (or till it’s as you like it!). My recent posts Your Local Butcher, Mise en Place (Simple Turkey Stock), and Winter Vegetable Garbure. Alton Brown shares a brief history of eggnog. My past cocktail posts featuring dark rum or bourbon: the Rum Old-Fashioned, the Dark & Stormy, and the Derby. Jeni’s Ice Cream is back! Her seasonal flavors should be online soon. i like your recipe much better! Farm fresh eggs, real cream, real milk, and some pretty good booze. Nothing truly top-shelf but certainly far from the bottom….Maker’s Mark, Myers Dark, and a cognac from France. so i have a few mason jars from a batch i made 2 years ago following your recipe. how does one ensure they are safe for consumption? are there any visual / smell clues to be on the look out for? If you hear tapping from inside the lid, I’d advise against opening it. Seriously, though: If it’s gone bad, you will know when you open the lid. There’s very few more aggressively funky things on earth than spoiled ‘nog. Does it need to be a glass jar? The only convenient gallon containers I have are plastic milk jugs. Would there be a problem using those? I’m not an expert, but I believe the plastic used in disposable containers (like milk jugs) are not rated for reuse. I think the problem is that you can’t get them clean enough, which runs the risk of getting bad bacteria into your food. This concern is even more important when you’re aging something. I made this last year (about this time) and was completely blown away by it. This year, I’ve got 2 batches going — one for the wife and I. The other for close friends that we know would enjoy. Thanks for posting this last year…and again this year. TOTAL treat! Great recipe. I do member when I was doing something similar at home. Instead of bourbon I use the rum and right time to cook it is Christmas time around. Have a good one. Tapped into my aged eggnog tonight, I did not make enough for the hollidays, tip – make 4 times what you think you need , and two batches of Chex mix for gifts. I wanted to comment how much I liked each Novella after reading it, but I did not want to reveal any plot or story line to my fellow bloggers. I still don’t, but I will highly recommend this book. And as I did by coincidence,a viewing of the Criterion Collection of the movie ” Harold And Maude”. I re visit this film once very decade or so, it is not perfect. It has elements beyond perfection. When I first viewed it, I snuck into an R rated film, much younger than Harold. I’ve seen it a few times since. Now I’m probably closer to Maudes age. Each viewing has its awkwardness and perfection, moments of beauty. A sunset, a Cat Stevens song,a daisy. A daisy will not last. It will decompose, wilt, rot, smell bad, become composte. But the story is preserved forever. Lots of stuff to reflect on, but for my fellow bloggers, I will not reveal any storyline. Only the void after finishing the story. It is un fill able. Reynolds Price will have to suffice. And Donnas towering photo, it has its own beauty, the first time I came across this blog was a martini glass filled with two year old eggnog. 2008?, A fan ever since. I just “found” the remnants of last year’s eggnog in the back of the downstairs fridge. It was separated, but smelled just fine when I opened the lid. Shook it vigorously to recombine everything, and then hubby had a full glass. It was so smooooooth and wonderful! Now I have to get started on this year’s batch! I’m going to do this with a hermetically sealed jar. Do I need to burp it every day or so? Or should it be fine?